Good news for both Gatwick and Luton airports – and London too. Andrew Sharp was for many years a stalwart at the then British Rail with senior posts in marketing and commerical, retiring when it was privatised in 1997. That year he became Director General of the International Air Rail Organisation (IARO) and is presently the policy adviser to the organisation. He seemed the perfect person for Business Travel News to send to Germany following an invitation for an update on the new trains that will serve much of London’s commuter services in the years to come. The Thameslink, Southern and Great Northern (TSGN) rail franchise, which serves both Gatwick and Luton airports are about to see a new lease of life . Under construction by Siemens in Krefeld (Germany) are what is called the ‘series 700’ rolling stock. 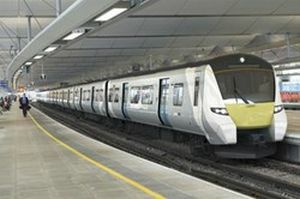 The 60 eight-car trains and 55 12-car trains are being built for Thameslink: a similar 150-strong fleet goes to South West Trains, for suburban services from Waterloo. Key messages are that these trains are lighter than their predecessors (needing less energy and causing less impact on the track, leading to less maintenance), they will run more often (so there will be an 80% increase in the number of seats through the central core from December 2018), and they will serve more destinations. The plan is to run 24 trains an hour each way on the section between Blackfriars (where routes from Sevenoaks, Brighton and Horsham will converge) and St. Pancras (where trains will diverge to Luton and Bedford on the Thameslink route and Cambridge and Peterborough on the Great Northern route). To run this frequency reliably needs a degree of automation, so Automatic Train Operation – to be used only in the central core – is being built in. Trains will also be equipped with Level 2 ERTMS (European Rail Traffic Management System); and a Driver Advisory System is also planned which will recommend speeds to ensure that trains from the different branches present themselves at the central core in the optimal sequence. This – a kind of flight control system – will operate within 20 minutes of the central core. All trains passing through the central core will carry Thameslink branding, although Great Northern style will be retained for those running north from King’s Cross and Moorgate to places like Hatfield, King’s Lynn and Stevenage. There are plans to base technicians at strategic locations so that they can attend to any faults: trains will be able to transmit condition monitoring data to a central control point. Where possible, equipment is ‘plug and play’ so that it can be replaced and repaired at a depot rather than on the train. The interior design is a compromise between the need for high-capacity high-density commuter services and more comfortable longer-distance airport services: there are luggage stacks by most doors. The 2+2 seating means that the aisles are quite wide, as are the two double-leaf doors on each side of each car. On-train information includes the location of less-crowded coaches (from train weight sensors: plans are being formulated to replicate this on platforms), as well as the location of toilets (of which there are six in a 12-car train). Gangways between vehicles are wide, so it should be easy to move through the train. A 12-car train will have 665 seats (613 standard class, 52 first). These are cantilevered out from the train sides, so that there are no obstructions on the floors – which should facilitate cleaning – and are more comfortable than they look. There are tables and power points in the first class accommodation (which is at each end of the train). This area also has additional leg-room. Whilst journey times between London and the two airports are unlikely to change, the service frequency and range of places with direct trains will improve considerably. Luton Airport Parkway will have 16 trains each hour, 12 of them semi-fast: there will be through services to East Grinstead, Maidstone, Sevenoaks and Littlehampton as well as the present Brighton and Wimbledon trains. Gatwick now sees four Thameslink trains each hour, all from Bedford: this will increase to 10, with six from Bedford, two from Peterborough and two from Cambridge. The indicative time from Cambridge to Gatwick, for example, is around 95 minutes. Luton Airport wants four fast trains per hour taking just 19 minutes. Farringdon will become a major interchange point, with 24 north-south Thameslink trains each hour and 24 east-west Crossrail trains an hour as well as the present Circle, Hammersmith & City and Metropolitan Line trains. Crossrail will serve Heathrow and Reading in the west and Woolwich and Shenfield in the east: the number of journey opportunities facilitated by this interchange will be much enlarged. With a change at Liverpool Street, Stansted will be accessible; and there is a plan for a Crossrail station to serve London City Airport too. The new trains will be dual-voltage: they will change between 25kV AC from overhead wires (for routes north of Farringdon) and 750v DC from the third rail (for the network south of the Thames). The first one will enter service next February with a full new service from the December 2018 timetable. The Thameslink programme is costing £6.5bn, of which £4.6bn is being spent on infrastructure – in particular, at Blackfriars and in the London Bridge area. It is due to be completed in December 2018, with through services from Great Northern destinations from May 2018.